ESPN’s Four-Day, On-Site Studio Coverage of the College Football Playoff National Championship Begins Today - ESPN Press Room U.S.
ESPN is taking over the Bay Area for the College Football National Championship Presented by AT&T featuring No. 1 Alabama vs. No. 2 Clemson in what promises to be the zenith of the 2018 season. Studio coverage began this morning, January 4, and will continue right up until kick-off on Monday, Jan. 7, at 8 p.m. ET, bringing fans more than 30 hours of content across ESPN, ESPN2, ESPNU and SEC Network. ESPN will be live from multiple locations including The Quad at Plaza de Cesar Chavez, the San Jose Convention Center, the SAP Center and ESPN’s fan activation billboard – all in in San Jose, Calif., and Levi’s Stadium in Santa Clara. Over the course of the four days, nearly every live show will feature coverage from the west coast, including Get Up!, NFL Countdown, and all editions of SportsCenter, along with special CFP National Championship centric editions of Championship Drive and College Football Live. Tom Rinaldi will report on Clemson throughout the weekend and Maria Taylor on Alabama, joining multiple shows providing the latest news and information around the two participating teams. ESPN will also have various features throughout the weekend, including Chris Fowler’s sit down interviews with Nick Saban and Dabo Sweeney and Gene Wojciechowski’s conversation with Clemson quarterback Trevor Lawrence. SEC Network will also have an extensive presence in the Bay Area, including its signature studio show SEC Now from The Quad at Plaza de Cesar Chavez. Complete details on the network’s plans are found here. ESPN will have day-long coverage on Championship Monday with on-site hits from Levi’s Stadium beginning early with SportsCenter, Get Up!, and First Take on ESPN and Good Morning America on ABC. Mike Golic, Jr. and Jason Fitz will join Golic and Wingo beginning at 6 a.m. on ESPN2 and ESPN Radio. The coverage intensifies at 1:30 p.m. with College Football Live on ESPN from Levi’s Stadium, hosted by Adnan Virk, joined by analysts Joey Galloway, Paul Finebaum, Todd McShay, Jim Mora and Jonathan Vilma. 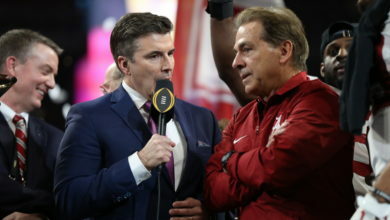 The show synonymous with college football, College GameDay Built by the Home Depot will air a special two-hour edition at 3 p.m. coming from Champ Tailgate outside of Levi’s Stadium hosted by Rece Davis, joined by mainstays Kirk Herbstreit, Desmond Howard and David Pollack. Auburn head coach Gus Malzahn and Texas A&M head coach Jimbo Fisher will join the show as guests. Tim Tebow speaks one-on-one with Alabama quarterback Tua Tagovailoa. Leading directly into the championship game, ESPN presents a multi-network, multi-platform countdown to kickoff. Championship Drive Presented by Mercedes Benz will air on ESPN from 6-8 p.m. hosted by Davis, joined by the legendary Lee Corso, Herbstreit, Howard, Pollack, and Tebow. Corso will make his signature headgear pick to close the show. Pregame Field Pass will be available on ESPN2 at 6:30 p.m., when Adam Amin and Steve Levy bring viewers the pre-game atmosphere from field level. Laura Rutledge hosts SEC Nation Presented by AT&T from 6- 8:15 p.m. on SEC Network, joined by regular SEC Nation deskmates and analysts Tim Tebow, Marcus Spears and Paul Finebaum, and reporter Lauren Sisler, with SEC Network analysts Gene Chizik, Greg McElroy and Jordan Rodgers providing additional pre-game insight. Preceding the show, The Paul Finebaum Show will air from 3 p.m. – 6 p.m. on SEC Network from the Champ Tailgate location. Golic, Jr. and Fitz return, along with Treavor Scales, for The College Football (Playoff) Show at 7 p.m. streamed on Twitter via the @espn handle. Following ESPN’s MegaCast Presentation and the crowning of a new national champion, the night concludes with SportsCenter with Scott Van Pelt on ESPN, College Football Final presented by Capital One on ESPN2 and SEC Now on SEC Network all recapping the best moments from the game. A programming grid of ESPN’s National Championship Monday is provided below. College Football Live will air at 4:30 p.m. from The Quad at Plaza de Cesar Chavez hosted by Virk, who will be joined by Galloway, Mora, Palmer, and Vilma. Virk, McShay, Mora and Vilma will anchor the coverage on ESPNU. Rutledge, Spears and Tebow, along with reporter Lauren Sisler will be on SEC Network. Sunday’s coverage closes out with a special edition of Championship Drive at 8 p.m. hosted by Adnan Virk joined again by Mora and Vilma.